The Soundforge is a recording facility founded by Kai Mertens of Harmony Dies and Andreas Hilbert of Golem in 1998. Since then a lot of bands recorded their demos or albums in the little village Großziethen near Berlin. Not all, yet most of these are bands of the more extrem metal direction like Sinners Bleed or Defeated Sanity. Of course our own albums were recorded there as well. 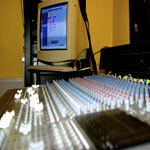 We do have all the stuff needed to do high quality recordings that can compete with major productions. We started recording on a 24-track 1" tascam but nowadays we do hd-recording on a windows based system with logic audio platinum. There is a behringer 48 channels inline mixing desk, mics for most purposes, the usual effects and dynamic units, drum triggering equipment and professional monitoring. The prices are more than fair and there is also the possibility to stay in the house overnight. So everything is arranged to have an inspiring recording atmosphere and a lot of fun too. In spring 2005 we moved to Berlin and now we also got a dedicated homepage for the studio. As a new member Mike Poguntke joined forces in our recording team. He formerly did on-location-recording for some german grindcore bands. For further information check the ►contact page the ►soundforge homepage or listen to these ►audio samples.